Concern over continued food insecurity into 2017 is growing as farming remains undermined by lack of seeds and debris clearance. Humanitarian partners are increasingly concerned about the nutritional situation in the most affected areas. The Emergency Food Security Assessment (EFSA) conducted by WFP and the national Centre for Food Security (CNSA) in the immediate aftermath of the hurricane had revealed that some 806,000 people were in situation of severe food insecurity, which increases the risk of malnutrition among vulnerable groups such as children under five (12.5% of the population) as well as pregnant and lactating women (2.5% of the population). UNICEF, the Ministry of Public Health and Population (MSPP) and their partners conducted active screenings in November in three of the most affected communes in Grand’Anse (Les Irois, Anse d’Hainault and Dame Marie) and six communes in the Sud region. Findings point to a worsening nutritional situation with malnutrition levels two to four times higher than levels in normal screenings. Moreover, in the regions most affected by Hurricane Matthew, which account for 60% of the national crop production, crop destruction ranged from 75 to 100%. The winter planting season is closing in the next few days and only a fraction of farmers have received new seeds (18%), while debris clearance is ongoing, also hampering resumption of agriculture. Fishing has also been impacted by the destruction of assets. Food stocks are exhausted. The region is therefore at risk of continued high levels of food insecurity, with a peak by mid-2017 if the yield of the next planting season in March is not optimal. This situation points to the importance of an early shift towards recovery. To date, some 150,000 people have received income generating support in order to kick start recovery. The revision of the EFSA will be conducted by the partners between 15 and 22 December. However, so far, the shortfall for the WFP Protracted Relief and Recovery Operation amounts to 44% of requirements. USD 21 million is required to provide full food assistance rations to 800,000 beneficiaries for three months. Due to the limited funding, the ration distributed has been reduced to 83% of a full ration. Of the USD 9 million required by FAO under the Flash Appeal, USD 5.6 million is still missing to provide immediate crop, livestock and fisheries support to 300,000 hurricane-affected people. "EDH van kouran, EDH pa fe kado kouran" (EDH sells electricity, EDH does not give away electricity) can be read on the shirts of participants at an awareness-raising activity in Cayes on the need to pay electricity bills. 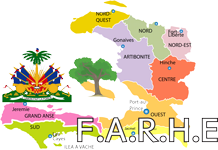 Haiti’s electricity company [L’Electricité d’Haïti EDH], the largest State-run enterprise, which constitutionally has a monopoly to sell electricity, is trying to explain to Haitians that the EDH is a commercial enterprise that risks bankruptcy if it doesn’t generate revenue. Since 2006, the World Bank has sought to improve the quality of electricity supply and strengthen the financial and operational management of the EDH through the Electricity Loss Reduction Project (Projet de Réduction des Pertes du Secteur Electrique PREPSEL). Since 2011, PREPSEL has facilitated the establishment of a computerized Business Management System (Système de Gestion Commerciale SGC) at the company’s headquarters and at each sales office in the metropolitan area. Long-distance communication via the Internet is helping to improve client service, reduce the processing time for requests, and correct problems more quickly.